The SnoreMender PS design looks very simple until you see that it opens and closes easily (see video below), which is rare for one of these anti-snoring mouthpieces. Being able to move your mouth while wearing a device is a pretty attractive quality, but I’m sorry to tell you that my experience with this device was far from favorable. The patented hinged design allows you to move your lower jaw up and down. Pressure Shift Technology takes stress off the small front teeth and redirects to stronger ones. Material is free of BPA, latex, and silicone. Device is ready-to-use right out-of-the-box. Backed by a 90-day guarantee. Free shipping is provided on all devices. Mouthpiece is priced affordably for a smaller budget. SnoreMender PS has a long lifespan ranging from 9 to 18 months. One size really does not fit all. You can’t receive a refund until you have given it a “fair” trial of 90 days. No mention of it being cleared by the United States Food and Drug Administration. Device may cause jaw pain. 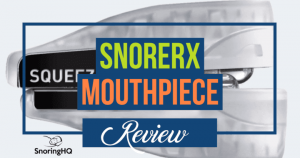 SnoreMender PS is a great snoring mouthpiece concept that is poorly executed. The material and price are right, but the design is all wrong. I found it to be very uncomfortable and overall not effective. I like the idea, but I think some other mouthpieces on the market are a much better option. 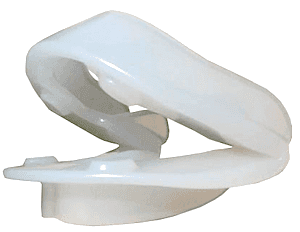 SnoreMender PS is classified as a mandibular advancement device (MAD). It helps keep your airway clear to reduce the chance of snoring by holding your lower jaw in a slightly forward position. 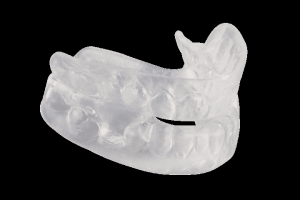 This mouthpiece is made of a very smooth, opaque white medical-grade dental thermoplastic that contains no BPA, silicone, latex, or phthalates. The material alone made me think this device had potential, but sadly its safe and nonirritating material does not compensate for its flaws. This MAD does not require a fitting process, so it is ready to go right out of the box. The device has a flexible frame with a patented hinge that allows natural jaw movement. 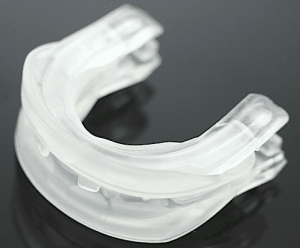 Depending on how long you have been looking at stop snoring mouthpieces, you may be thinking this device is quite similar to ZQuiet. Well, the concept is the same, but the craftsmanship does not compare. That being said, the flexible frame does reduce pressure placed on your jaw. Since this device is flexible, you are able to keep your mouth open, so if you generally breathe through your mouth, you will have no problem breathing while using this device. Also, since it is simple and smooth there are no crevices to harbor bacteria or special tools to keep in a safe place to make further adjustments. SnoreMender’s standout feature is its Pressure Shift Technology. This design is suggested to redirect pressure to large, strong teeth to relieve pressure that mouthpieces often apply to front teeth. I am a huge fan of ZQuiet. In fact, it is my second favorite stop snoring oral appliance. So, naturally, my curiosity was piqued when I discovered another MAD with some type of hinged technology. My wife was also excited to try SnoreMender PS because she loves ZQuiet, too. When our devices arrived, I washed them right away. I’m glad I actually looked at the instructions first because they said not to use hot water or toothpaste. I just used lukewarm water and mild dishwashing soap. It does say to run hot water over the hinges to relax them, but make sure it is only the hinges and you don’t need to do it all that long either. SnoreMender is ready-to-use immediately, so it didn’t have to deal with the boil-and-bite process (not that the molding process is hard by any means). When we put them in before bed no words needed to be spoken. We were both expecting a comfortable mouthpiece like ZQuiet, but it is far from what we got. The hinges on this device may move, but it was far from comfortable. First, it really did not fit my mouth right. I felt like I was trying to put a square peg through a round hole. The trays didn’t line up with my jaw. If it was a soft, flexible material maybe the fit would have been better. It felt like it was a little too small for me, but it was way too big for my wife. She immediately opted out of this trial knowing there was no way she could wear it an entire week. The instructions did say it could be filed down, but I don’t think any amount of filing would have helped. The device does allow you to breathe through your mouth, and it didn’t make me drool as much as other devices, so it had one thing going for it. It really didn’t feel bulky either. I fell asleep quite quickly, but when the dog woke me up to go outside in the middle of the night the mouthpiece was nowhere to be found. In the morning, I felt tired and grouchy, which is exactly what I was expecting. I did not get any quality sleep. Usually, when a device does not work the first night, I try remolding it to see if I need to tweak the fit. Unfortunately, extreme changes can’t be made to this mouthpiece. The second night, the same thing happened. I really did not see much hope for this product, but I thought I would give it one more effort anyway. On the third morning, I disregarded the instructions and ran the device under hot water just to soften it to see if I could stretch it a bit to fit my jaw. Initially, I thought it might work, but as it cooled and contracted the fit was returning to its original state. SnoreMender can be altered to an extent, but making it wider just did not work. I could not bring myself to sacrifice one more night of sleep. One SnoreMender PS is $57. If you order two, they are $49 each, and if you buy three, you pay $43 per unit. All options include free shipping. It is also backed by a 90-day guarantee. SnoreMender PS is a great concept that is poorly executed. The material and price are right, but the design is all wrong. If you are interested in the hinged design I recommend ZQuiet. It also has a hinged design, but it is a soft, flexible, rubber material that is comfortable and fits well. Plus, you only have to pay shipping upfront to try it for 30 days. If you try ZQuiet without success, read my SnoreRx review.